The photo to the left is the "Counts Bench" which was in front of Don's Den from 1958-1970. The name on the top is Mike Whitfield, John Haviland, carved a line and wrote "this is where I sit" and then carved his name to the right of it. The bench holds more than historic carvings. It represents times and places like Pizza Palace, Big Wheel, Hot Shoppes, Jimmy's Hurricane, Danny's and Crystal's. 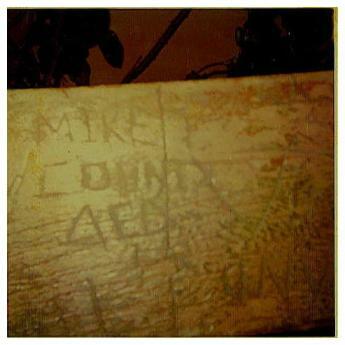 The bench was more than 60 years old, the graffiti has been dated back 51 years. It was a time when High School was similar to college and the dress code said "NO JEANS"..... A time when the fraternal order of sisterhood and brotherhood held high codes of honor, civilizing a heritage from an era that will never be again.